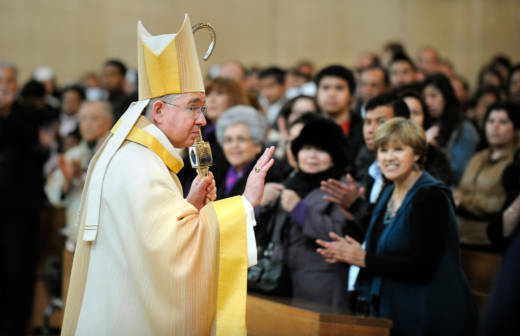 Toward the end of a special Youth Day service at the Anaheim Convention Center last Thursday, Los Angeles Catholic Archbishop Jose Gomez paused to address the several thousand Catholic celebrants in the arena. The archbishop’s comments, received with a roar of applause, came on the opening day of the annual archdiocese-sponsored Religious Education Congress. Immigration was a major theme this year with special masses and workshops dedicated to the issue. 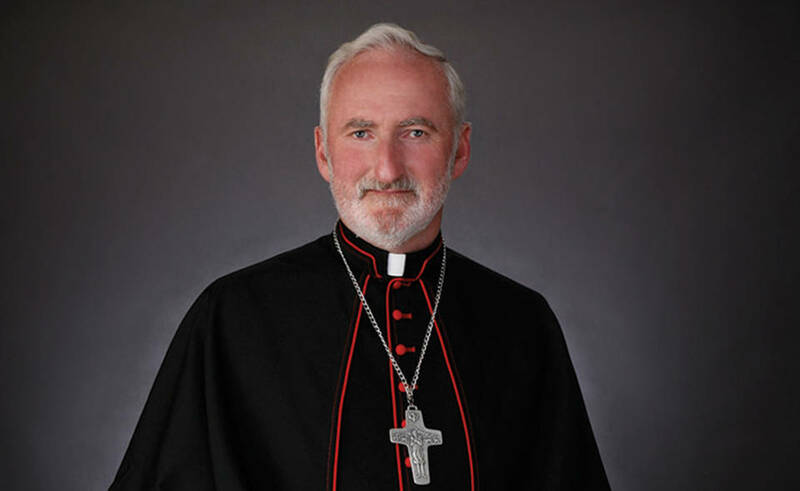 We sat down with L.A. Archdiocese Auxiliary Bishop David O'Connell, who on Saturday led a forum on how the archdiocese is responding to President Donald Trump’s executive orders that aim to dramatically increase the deportation of noncriminal undocumented immigrants. What steps is the archdiocese taking to assist immigrants in response to the heightened risk now of detention and deportation? We’re trying to form these groups in the parishes, who will talk to the moms and dads who come to Catechism, the moms and dads involved in the prayer groups and whatever groups so that people know their rights as immigrants. We hope for the best, but we prepare for the worst. What are you hearing from parishioners who are undocumented, what kind of fears or anxieties are they sharing with you? Well, there's a lot of anxiety, and I think it's growing as we get these (presidential) executive orders coming out. Children are afraid because they're wondering: When I come home from school will my mom be there? Will my dad get detained, will he get deported? And what do you tell them, how do you reassure someone who comes to you? Noel Diaz (Los Angeles parishioner invited this month to travel from the Vatican to Mexico with Pope Francis) from Los Angeles here, he had an interview with the pope and he asked him: Any words for the people of the United States who are so nervous now about their immigration status? And the pope said: We return to our faith in Our Lady of Guadalupe who is very special for the people of Mexico, for all of the Americas. (We) put our confidence in her, that she will help us and protect us. And I would say, we are with you as a church. We are part of the same family, part of the same body of Christ. Your suffering is our suffering. And what we are trying to do also is create these networks where people can have a phone number to call if they need help. We’re taking all these steps to try and help and make sure people know that they are not alone. We've seen a big rise in nationalism and a real backlash against immigrants, against refugees and people of certain faiths. Not just here in the U.S. but in parts of Europe and elsewhere. So what message does the archdiocese have in response to this phenomenon, not only for people here in L.A. but globally? Because I think the archdiocese has a pretty outsized influence internationally. Well, I came here from Ireland way back almost 40 years ago. I started working in South Los Angeles; I was certainly a stranger in South Los Angeles when I moved in as a pastor. But I know also that I was received with great love. You would have been a real minority. I was a minority of one! Someone said, 'So how many Irish are there in South L.A.?' I said about one. They said, 'Oh 1 percent? I said; no, one!' Except for maybe a few other Irish priests around the place here and there. But this is what I want to say to the world, and that is not to be afraid of the stranger. The church is taking a fair amount of criticism for its stance on this issue of immigration. I have had anti-illegal immigration activists tell me it’s a ploy to keep the pews filled on Sunday, to get money in the collection plate. Because a large part of the Catholic Church’s denomination, especially here in the L.A. area, is Latino. Well, it makes me sad to hear that. All my years working in South Los Angeles, working with immigrants, it never once crossed my mind to help another human being just so that I would have somebody else in my church. We are not here really to serve the church; we’re here to serve the world, to serve the people, especially those who are suffering. And we certainly respect the laws of our country and our borders and the right of a country to form borders. But in any way we can, we also have to help those who are in need. And that’s not partisan, not left or right. It’s the Gospel. It goes back to who we are. We can’t ignore the suffering of the people around us. Because then we are less human, we’re less Christian. And we are breaking that covenant we have with each other. As you have been saying, a lot of immigrants are pretty panicked right now, they are anxious. I've heard some religious leaders express this willingness to open their places of worship as sanctuary. Is this something that is discussed seriously among those in church leadership? Well, we have talked a little bit about this. We’re doing what we know how to do right now. We’re meeting with Archbishop Gomez, with the mayor, helping people get their papers organized, helping them to have some ability to get legal representation. These are kind of practical ways in which we can give sanctuary right now, without moving to the issue of bringing a few families into church property. They can’t live there indefinitely in some parking lot. We’ll do whatever practical things we can do right now, and then just be open to whatever (may happen). But, I’m sure if it came to that (providing sanctuary) I’m sure we’d be open to looking at that possibility.